The Zebra P330i printer is the perfect solution for producing high volumes of identification cards in no time at all! P330i offers fast and attractive personalization of cards making them ideal for a wide range of identification cards. The Zebra P330i resolution ensures exceptionally sharp print quality, as the cards take around 25 seconds to print in full colour or less than 5 seconds in monochrome. Zebra P330i has a fantastic translucent cover allowing you to see when supplies are running low, with the facility to add blank cards while printing, resulting in no down time. The design of the self-aligning print head ensures uniform print quality as well as edge-to-edge printing. The useful LCD panel assists the operator by describing clearly the current status of the printer. It even provides a reminder when routine cleaning needs to be done. 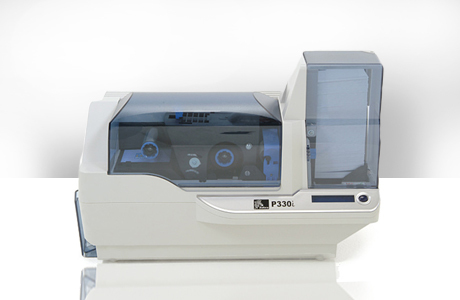 The Zebra P330i is ideal for both instant card issue and batch runs. Plain or pre-printed cards can be loaded into the input hopper, and by using dye sublimation or thermal transfer technology, the image, signature, data and graphics can be printed on the surface of each card in full colour. The finished cards are then coated with a hard, clear overlay varnish to give additional protection.